Today in San Francisco, NASA scientists announced that Europa -- one of dozens of moons belonging to the largest planet in our solar system, Jupiter – appears to have giant geysers erupting from its southern pole. The existence of geysers bolsters the current belief that Europa’s icy crust covers a vast saltwater ocean, possibly with underwater volcanoes. 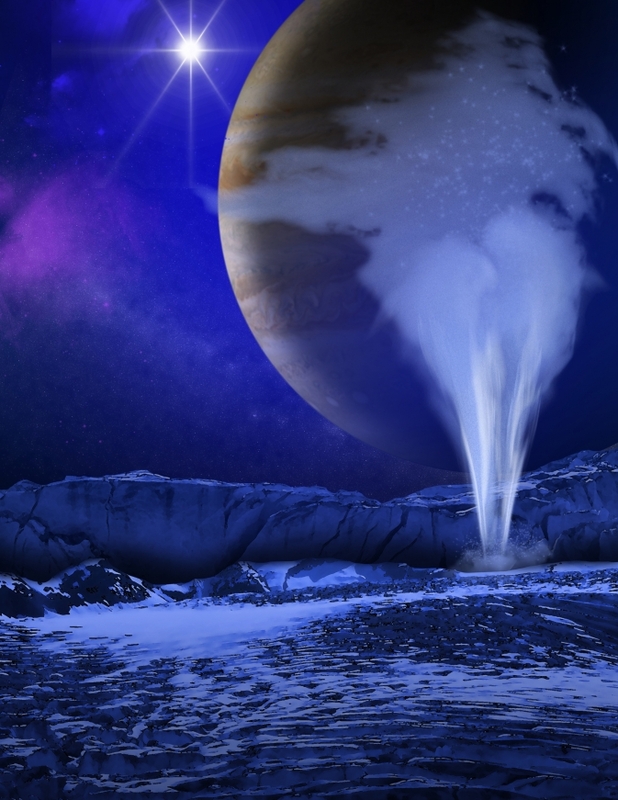 If there’s life swimming around down there, the geysers are most certainly spewing it onto Europa's surface and into the atmosphere -- at a rate of approximately seven tons of material per second -- where future NASA missions might be able to grab and study it. "If the vapor comes from the oceans below, then we have a new way to explore its composition," said NASA's Kurt Retherford, also of Southwest Research Institute, speaking at the annual meeting of the American Geophysical Union. The observations come from the Hubble Space Telescope's spectrograph, which captures ultraviolet images. They wouldn't have been possible without astronauts who, in 2009, completed one of the longest space walks in history -- over eight hours -- to fix the instrument. 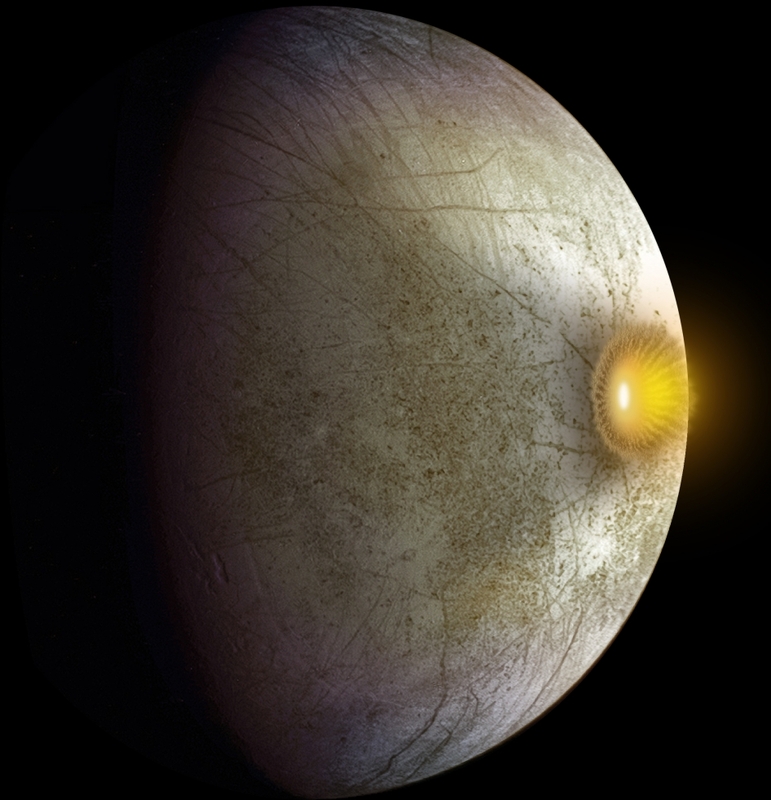 Scientists have long suspected that Europa could harbor life. But without a way to puncture the moon's thick icy crust, further understanding seemed elusive. The vapor plumes could change that. So far, scientists have only spotted the plumes at Europa's south pole, but north pole plumes may exist as well, said scientists at the press conference. "We want to explore those too," said James Green, NASA's Chief of Planetary Science. The plumes appear to come and go as the moon is influenced by Jupiter's powerful magnetic field. "When Europa gets close to Jupiter," said Francis Nimmo, a professor in the Department of Earth and Planetary Sciences at UC Santa Cruz, the moon "gets stretched and the poles get squished. And so when the poles are getting squished, all the cracks close up. And then as it moves further away, it becomes unsquished, the poles move outwards. And that’s when the cracks open." With its liquid water and internal heat source, Europa is starting to look like one of, if not the best, candidate for finding extra-terrestrial life in our solar system. This comes as a surprise to astronomers who long believed the solar system's "habitable zone" -- where heat from the sun would allow for the presence of liquid water -- ended at Mars. "When we saw Europa and realized that it had the energy, the organics, and certainly the water," said Green, "it changed our ideas to where habitable zones can exist. We now believe habitable zones can exist around these large planets." A spectacular collision with an asteroid or comet could have delivered the building blocks of life. This week scientists also announced new findings based on 15-year old data collected by NASA’s Galileo Mission, showing that clay-type minerals on Europa’s surface appear to have been delivered by a spectacular collision with an asteroid or comet about the size of Comet ISON. That object may have delivered organic materials that could, over time, give rise to life in Europa’s ocean. Jim Shirley, a research scientist at NASA’s Jet Propulsion Laboratory in Pasadena, says if life exists on Europa, it might be comparable to life found near deep-sea vents here on Earth. "We know on Earth that life can evolve in the absence of light, with the right chemistry," said Shirley. "And so one of the questions about this is how would we get carbon, the building blocks of life, into the ocean? And we have evidence now that impacts can bring the carbon." “With the energy, the water, and now organics,” said Green, “that really means life could exist on Europa. One mission, called Clipper, currently in the concept stage, could send a spacecraft into Europa’s plumes to sample and analyze the vapor and any traces of life. But with an estimated price tag of several billion dollars – similar to the cost of the Curiosity Mars Rover – that mission could be a decade off, or more, said Green.